A fire truck pulls into the truck bay and idles for a minute or two as a firefighter attaches tubing to filter the exhaust out of the station. The firefighter’s face may be close to the exhaust for 30 seconds while the tubing is attached. It’s a routine task, one that’s performed by the same firefighter as many as 30 times a day as a crew responds to calls. While many studies have focused on whether firefighters’ regular exposure to toxic compounds when fighting fires increases their cancer risk, Dana-Farber scientists are partnering with the Boston Fire Department in a novel exposure assessment of cancer risk factors – like diesel exhaust – at firefighters’ second home: the fire station. 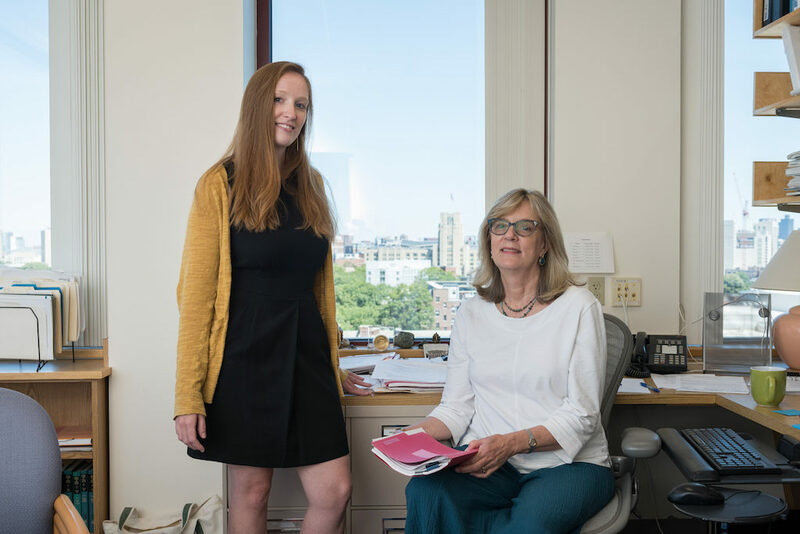 “We are looking at chronic low level exposures in the fire station,” says Emily Sparer, ScD, a postdoctoral fellow working on the pilot study with Glorian Sorensen, PhD, director of the Center for Community Based Research in the Division of Population Sciences at Dana-Farber and the Harvard T.H. Chan School of Public Health. “We will be looking at occupational exposures and combining those with other potential factors in firefighters’ daily routines,” says Sorensen. The effort is part of work funded by a federal grant to the Harvard Center for Work, Health, and Well-Being, of which Sorensen is the principal investigator, with additional funds for the pilot study provided by the Chan School’s Occupational Safety and Health Education and Research Center. Sparer and Sorensen began working with the Boston Fire Department in 2015 after Deputy Fire Chief Greg Mackin reached out to Dana-Farber expressing concern that local firefighters are being diagnosed with, and dying from, cancer at higher than normal rates. Studies have found significantly elevated rates of some types of cancers in firefighters, particularly multiple myeloma, non-Hodgkin lymphoma, prostate cancer, and gastrointestinal and lung cancers. 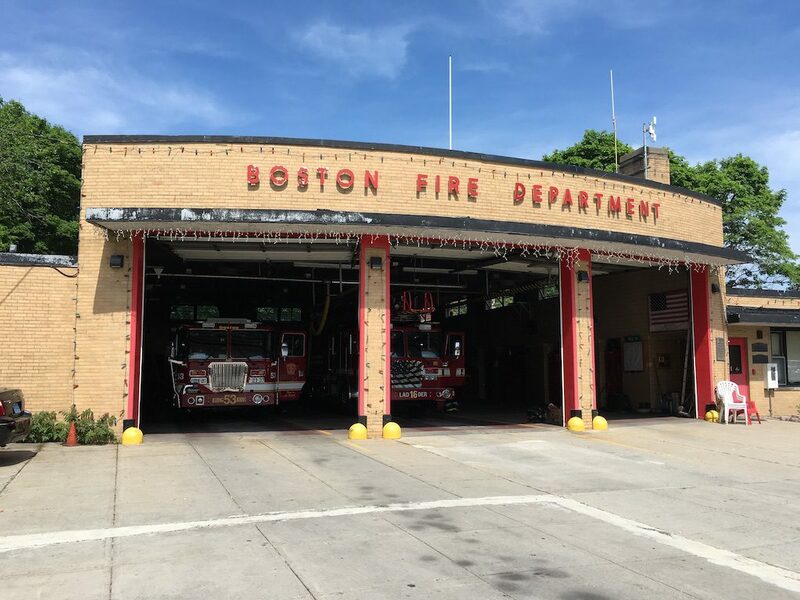 After meeting with representatives of the Boston Fire Department and the Boston Firefighters’ Union Local 718, Sparer set out to study exposures in the firehouse. For example, Sparer notes that because of the building design, which can date back to the 1800s in some fire stations in Boston, the kitchen may be located next to the truck bay. This may allow for diesel exhaust from the trucks to flow into the kitchen and potentially degrade the air quality. She conducted air sampling at three fire stations in Boston and one in nearby Arlington, a brand new station that will be used as a control in the study. “A new fire station may highlight the importance of good insulation and building materials,” says Sparer, who joined Dana-Farber in 2015 after completing a doctorate in occupational health at Harvard University, during which she studied cancer risk factors in construction work for five years. The project is fully supported by Boston Mayor Martin J. Walsh, who has made firefighter safety a focus of his administration, and who is a cancer survivor himself. Sparer and Sorensen, who are working on a number of initiatives with the fire department, may study other risk factors, including behavioral ones such as sleep and diet during a firefighter’s 24-hour shift. Thank you fro helping those that help us!! Having worked in a fire station for over 30 years and having been diagnosed with breast cancer (with absolutely no family history of the disease), I believe strongly that diesel exposure played a significant role in my contracting this illness. My office was located upstairs over the apparatus floor and whenever I cleaned, black oily residue was evident on the desks and file cabinets. Although we had a ventilation system in the latter years of my career, I believe theverything diesel fumes permeated the upstairs of the station. Thank you for your valuable research for all members of the fire service. Be sure to examine the Cincinnati study done a few years ago. I was diagnosed 3 years ago with Chronic non-allergenic rinitus. I had a cough for probably half of my 34 year career. I found last year that another firefighter I worked with has the me. I also am finding other career firefighters that are still working having a nagging cough. One article I found listed diesel exhaust as a possible contributer. I have a lump in a lung we are watching.